The purpose of the High School Choral Section is to provide educational and professional support for high school choral music education programs across the state of North Carolina. Our vision is to advance the musical growth and learning of all students enrolled in choral classes through the study of choral/vocal technique and music literacy. 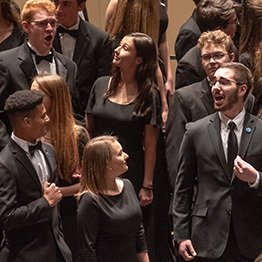 The High School Choral Section provides a variety of performance and adjudication opportunities that compliment each unique high school choral curriculum and the North Carolina Essential Standards. This website is a valuable source of information for current NCMEA members and new teachers. Sign up for our new Mentor Program. You will find links to our calendar, meetings, student events, adjudicator applications, constitution and by-laws (policies and procedures), MPA graded repertoire lists, professional development opportunities, announcements and news items, contact information of board and committee members, and new teacher info. These links will provide critical information concerning dates, deadlines, forms, and addresses. Your membership in NCMEA is a vital link to a successful high school choral program and a network of contacts for professional development. The challenge and joy of teaching young 21st century adolescents to create, interpret and appreciate music, whether in a choir of three hundred voices or a small ensemble of twenty-four or less, is our motivation for fostering a generation of leaders and musicians who are life-long participants in music.